One day, a few years ago, when I was making a deposit at the bank, the teller, Cindy, asked me about my business name, “Whimsy & Tea.” We started talking about kitchen towels, so on my next visit to the bank, I brought some with me. She purchased one towel, then a second one, and then asked me to weave a third that would pull the colors of the first two towels together. After her purchases, I continued to see Cindy regularly at the bank, and we’d chat about her towels. 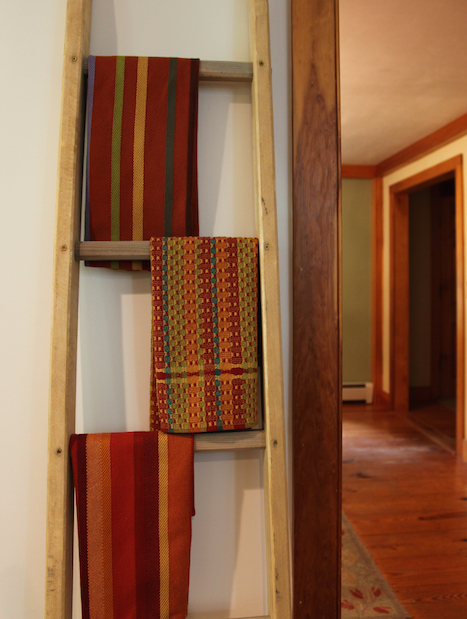 She told me that she’d created a display with the towels on an antique ladder. I weave kitchen towels with the desire that people dry their hands and dishes with them. I asked Cindy if I could interview her because I was curious about her use of towels as art in her home and I wanted to know more. Cindy Duffy had a long and successful career as a hotel, restaurant, vineyard owner with her husband John before working at the bank where she and I met. After Cindy and John sold their businesses, they built a home in the hills of Sonoma County, CA. The process of designing and building a home helped Cindy discover what is important in the scheme of her life and what fills her soul. What I love about this conversation with Cindy is learning that she has placed the towels and other special objects throughout her house as “soul-tinglers” – objects with special, personal meaning that make her soul tingle when she walks by them. What inspired you to buy a towel in the first place? The name of your company was intriguing to me. Then one day you actually remembered to bring some towels in to show me and they were just beautiful. I have this antique ladder in my kitchen and when I saw the towels, I thought the ladder would be a perfect place to hang these towels. I bought one for my sister-in-law too because we both like the same things. How do you use your towels? Not the way the weaver intended! I use them as art pieces really. I use them to bring me happiness every day when I look at them. They’re colorful and add beauty to my home. They’re made so beautifully and perfectly. What difference does having these towels make in your everyday life? I don’t know that they make a difference in how I live, but they make a difference in how I feel. They bring me joy. I like to have things around my house that I look at and think, “I know where that came from. I like the person I got that from.” They bring me happiness when I look at them because they’re something special. I didn’t buy them mass-manufactured from China. What difference does this soul-enriching feeling make in your life? I feel full. Like I have a full life versus I’m yearning for something. What I like about these objects is they make my soul tingly and happy. It’s not something I always think about, but I can feel it when I walk by. I feel the energy. It revives my soul and makes my soul happy and full. I think soul-tingling is a beautiful description. It actually is a physical feeling and it’s in my core where it tingles. I call that my soul. I tingle when I walk by these things. It’s like they are sending energy to me and I feel the tingle. And your towels are one of them. I can’t plan that; I can’t buy something and say, “That’s going to be my soul-tingler.” It happens after it’s been there. I’ve placed these soul-tinglers throughout the house so I get these tingles as I walk through the house. Some people have a sanctuary; mine are not just in one area. I want these things spaced out because I want to feel tingly in every part of the house. What’s important about this tingling? It feels good. It makes me happy. It makes me smile and creates a feeling of gratitude. I think gratitude is an underused emotion. This tingling feeling reminds me of gratitude because when you are grateful for things, you can kind of get a soul-tingle. I think more people should be grateful for many more things. It sounds like gratitude and soul-tingling are connected for you. When I bought the first towel, it was very special but it wasn’t until I got all three of them together that I got the soul-tingle. The first one was lonely and needed some friends to send the energy. All of the objects I have that I’ve kind of put on pedestals to enrich my life or my soul – they weren’t planned. That’s just the way they became. It sounds like a number of these special objects were gifts. When I think about it, a lot of these special objects were gifts. I think the gift element makes it that much more special. I feel a connection to the person who gave it to me or where I got it from. Now I bought your towels, but they were, in a way, a gift. They were a gift to me. From me. Part of the reason I asked to interview you is because you use your Whimsy & Tea towels as art. I personally love drying my hands on them so much, and you are helping me expand my ideas of what it means to use a towel. You know what, I may have to buy another one and dry my hands on it. Because the thing is, we are all getting older. Life is getting shorter. So why not dry my hands on something beautiful & useful versus something that’s got a hole in it and you’ve had forever. I always intended to use them as art pieces once I saw them, but you have made me realize I should probably buy one for my hands. I think I deserve it. Tell me more about this deserving. I am learning lessons from my mother. She is 88 and has kind of self-sacrificed her whole life. She will put off purchasing something because it’s not the right time. When is the right time? I want to have what I can and enjoy everything I do have now. Everything in my house gets used for my intended purpose. I’m at this point where I don’t want to put things off. I see with my mom, that time is counting down. I only purchase things for now. I like beauty. I like nice things. I’m not extravagant by any means. The very simple things are what’s important to me: a glass that fits in your hand really well to drink out of on a daily basis or a pillow that fits behind your back just right. And having a nice towel to dry my hands on which I do probably 20 times when I’m cooking dinner. I should have a nice towel to do that. What kind of towels do you use in your kitchen? I have some old beat up Williams Sonoma towels that don’t match a thing, but that that’s what I use. I’ve had them for years. I wash them and bleach them and they just don’t wear out. If you love your Williams Sonoma towels, you’re all set. I love them for the practicality, but I won’t think of them the same as drying my hands on one of your towels. It wasn’t until this conversation, until you said, “I love drying my hands on it,” that I even considered using one of your towels to dry my hands on. My invitation to you: Do you have a special object that makes your soul tingly and full? I’d love to hear what it is and how you experience the soul-tingling. What a great article, Marilyn! I love the idea of “soul tinglers.” What if we only had things in our homes that brought us this level of joy? Soul tingler objects in my home include: the table runner you made, a large egg-shaped box which has a cinnabar glaze, and a trio of small vases made by Jonathan Adler. All of these items are beautiful in a very simple, earthy way. I agree with you — what if everything, or at least the vast majority, of things in our home were soul-tinglers? How would that affect our quality of life? 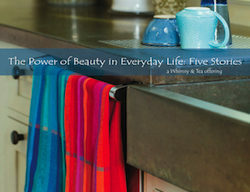 I’m honored that the table runner is among the objects in your home that brings you such joy. There’s a “little Marilyn” in each piece you craft. That makes my table runner very special. That’s why handcrafted things are so awesome! thank you for this. you stated that we can share your article. i want to print it and pass it out to my students. towels are my zen. to weave and use and also to sell. i offered a towel class and the reaction was ‘why would i weave a dish towel?’ maybe this will help me change their minds. You are most welcome, Maggie. I’m delighted you want to share it. I’d appreciate it if you include the url when you print it out. Towels are wonderful to weave and use, aren’t they? 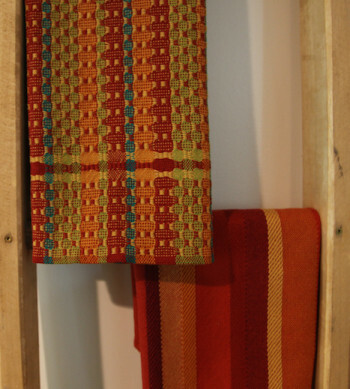 I hope your students come around and discover the wonders of handwoven towels.